GREENSBORO, N.C., Nov. 1, 2017 /PRNewswire/ -- Tanger Factory Outlet Centers, Inc. (NYSE:SKT) kicks off a season of fashionable savings with a new TangerSTYLE guide featuring the best looks for the season! From November 1- 19, shoppers can access the latest holiday fashions from top brand name and designer stores for less at Tanger Outlets. 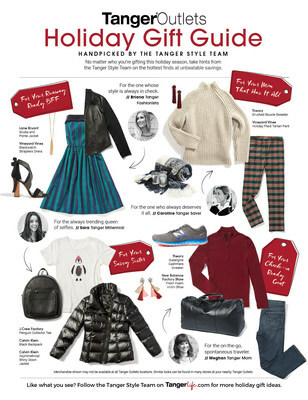 "We are excited to offer our customers the best in fashionable savings for the whole family, just in time for the holidays," said Steven B. Tanger, CEO of Tanger Factory Outlets, Inc. "We invite our shoppers to check out our latest TangerSTYLE guide to help them plan their holiday looks, and get a head start on their gift lists for friends and family at great savings." Reveal the Reds: Go bold in the season's brightest color, for day or night! Keen on Knits: This versatile closet staple gets updated touches that don't scrimp on style! Sultry in Suede: Pair on-trend suede items – jackets, skirts, and boots – with warm seasonal basics to elevate your look. Warm Up in White: Wear monochrome head-to-toe ivory, or accent with seasonal colors for a festive touch. Hello, High Shine: Light up the room with showstopping metallic touches and statement pieces. Tanger customers are invited to stop by shopper services to pick up the TangerSTYLE guide and 20% off coupons. Additionally, shoppers can also visit tangeroutlets.com or download the Tanger app to get coupons instantly. For more information visit www.tangeroutlet.com.